“If you think I’m pretty good, wait until you see Kyle,’’ he was fond of saying. Kurt was right. The kid, now a rather experienced 25-year-old, is one of the big names of NASCAR’s Sprint Cup series, with almost unlimited potential and driving for Joe Gibbs Racing, one of the strongest teams in the sport. In a lot of ways, the youngster has eclipsed his 31-year-old brother, even though Kurt has the family’s only Cup title (2004) and leads the brotherly competition in Cup wins, 20-16. The younger Busch, still learning his trade, has also been a force in NASCAR’s other two professional series, winning the Nationwide Series title last season and already the proud possessor of 31 race wins in the second-tier series and 16 more in trucks. So it’s no surprise that Kurt has become the “other’’ brother in the minds of many fans. But don’t feel sorry for him. The elder Busch, who finished fourth in the Cup points last season – trailing only the powerhouse Hendrick Motorsports trio of Jimmie Johnson, Mark Martin and Jeff Gordon – is hoping to give team owner Roger Penske his first NASCAR championship this season. Despite that finish, Kurt has started the season under the radar. While everyone expects Johnson and his teammates to battle for the title, along with JGR’s Denny Hamlin, hardly anyone mentions Kurt Busch and championship in the same breath. 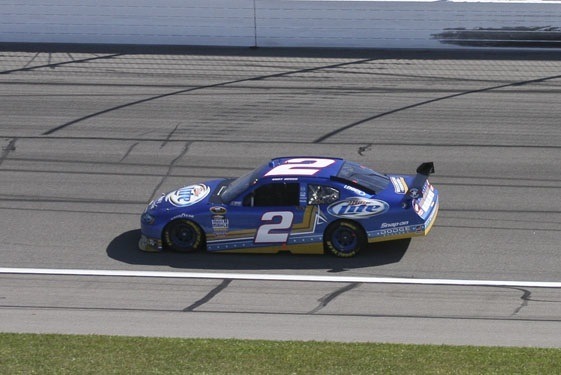 Two good reasons for that: Penske Racing could be at a disadvantage this year as the only Dodge team in Cup and Busch is starting the year with a brand new crew chief – Steve Addington, who previously worked with his brother. But none of that bothers Kurt Busch, who could hardly wait for the 2010 season to begin. Busch led 33 laps at Daytona before a late pit stop relegated him to a 23rd-place finish. Last Sunday at Auto Club Speedway in Fontana, CA, he stepped it up to a sixth-place run and now stands 11th in the points heading home to Las Vegas. Busch, who grew up in Sin City, would love to match his brother’s 2009 Cup victory at Las Vegas Motor Speedway. “I know just how much last year’s win meant to Kyle and it was a thrill to be part of such a huge hometown win like that,’’ Addington said. “We’re on a mission to get Kurt a big winner’s trophy of his own in Vegas this weekend. I know how special a Las Vegas win would be for Kurt and it would be a great accomplishment if we can pull it off. The memories of that day are vivid for Kurt as well. “It was a special win at a very special place for our family, so I made a mad dash over through the Neon Garage and into Victory Lane to congratulate my little brother,” the elder Busch noted. “I’ve always dreamed about winning the race there at our home track and we had a strong car there last year until we had the engine problem. But as everyone knows, you have to be there at the end. Kyle drove a great race and saved the best for last. I wanted to let him know how proud of him that I was, so that’s why I hustled on down there like I did. Busch will drive Dodge chassis 702 in this week’s race, something he considers an omen of good things to come. A win this early in the season would be a big boost for Busch, who has never finished better than third in nine Cup races at Las Vegas. That doesn’t worry the veteran driver, though. If Kurt does that, Kyle will just have to share the spotlight for at least a while longer. Git ‘er done bud, I know ya can do it.